I really needed this message from God this week. Once again am dealing with another sinus infection. Missed 2 days of work last week because of the vertigo keeping me from driving. Now half way thru my antibiotics & the right cheek on my face still hurt. What can I do? Well pray & give all of your worries to God. Everything will be ok.
Keep yourself open to some amazing possibilities. No question, Satan is at work trying to destroy, but God is at work too. He has an alternative purpose in the worst things we face. He’s a specialist at taking the darkest day and turning it into something beautiful in your life. This is exactly what the Bible is all about. God is a savior – the Savior. Most times His salvation takes a path we didn’t anticipate, and almost always it’s through, not around, our problems… and only when we yield our hearts and surrender our wills to Him. We’ve all had what might be referred to as a “Red Sea” moment – our backs against the wall, where every option seems to lead to disaster – but how about the real thing? Several million people without any ability to defend themselves and the army of Pharaoh bearing down on them with one purpose: slaughter. The Red Sea stood to their backs like a prison wall. There was nothing to do but wait for the inevitable. The people cried out against Moses, and Moses cried out to God for mercy, for help, for salvation. How big are your problems? Impossible? Insurmountable? A complete disaster? Gut-wrenchingly hard? This isn’t necessarily the bad news. When the scale of our troubles is beyond our abilities to do anything about them, God has the perfect opportunity to teach us something important. It’s as if God allows the trauma to escalate until we are forced to rely on Him. Did you catch that – “all things”? That includes the worst stuff your life has dished up to you, including the worst circumstances you’ve gotten yourself into. God says those things will work together for good. It’s hard to accept, but will you believe what God is saying here? Will you give Him your worst and let Him make something good out of it? He will manifest His power in the middle of your mess. When we come to the place where we are willing to give God our struggles, burdens, trials, messes, it’s a place of great release. Have you ever been under water for too long and then finally made it to the surface? Surrendering to God is like that, and He wants us to breathe in the life-giving air. I’m guessing it’s a lot like the Israelites felt when they made it to the other side of the Red Sea. But God didn’t want them to stop their journey. They still had a long way to go… and so do you and I.
It’s just one stop on the journey – a great place to rest and get our bearings – but He has something more for you and me. And everything in us is going to resist it because, humanly speaking, it’s unnatural, ugly even. But when we see this step through the eyes of the Spirit, something that was at first repulsive becomes a thing of breathtaking beauty. Determine to live through your struggles rather than around them. Try not to eliminate struggle, but ask God to help you discover His purpose in it. Lord, please forgive me for constantly running from You at the times when I need You most. Remind me of the times You have rescued me in the past. Thank You for showing me in the Bible where You did the same for your people. Help me realize that all life events are not about me and that there is much going on that I do not understand or even see. Most importantly, God, please help me remember that when You say all things will work together You are talking about Your perfect plan for eternity and not my immediate need for comfort. Thank You for including me in your plans, and give me wisdom and insight so that I can play my role as You have designed it for me. 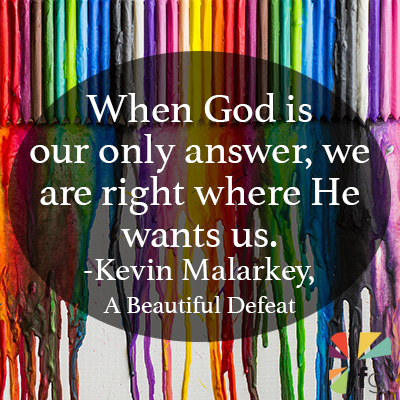 Excerpted with permission from A Beautiful Defeat by Kevin Malarkey, copyright Thomas Nelson, 2014.